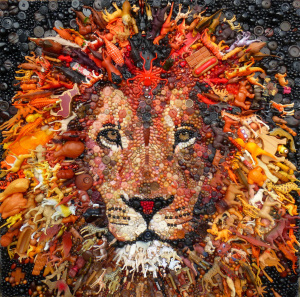 The mane of King of the Beasts is made up of hundreds of plastic animals. Both works will go on display in a one day exhibition – Art in the Aisles – in my local church of Kenton this weekend. After that …?? Beethoven has now been photographed and printed onto laminated aluminium (looking good!) and the next step is to film the disassembling of the original using time-lapse photography – a new process for me. The component materials will then be displayed in a clear jar (urn) alongside the print. Watch this space, as they say! This entry was posted on May 4, 2016 by Graham in Hats. 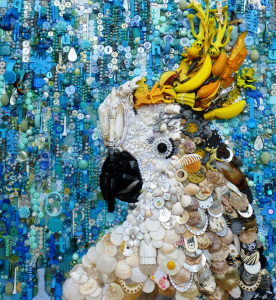 It was filed under Art and was tagged with Jane Perkins, recycled.